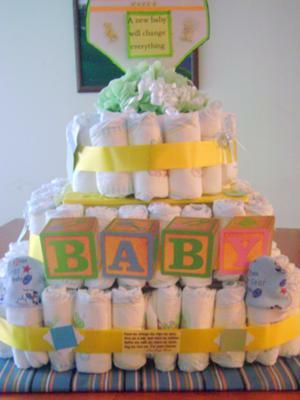 This diaper cake gift box is so creative! You have to read how Carol made this diaper cake below. It is a very cute diaper cake and very unique as well! Carol joins the many of our other readers who have submitted their own fabulous diaper cake ideas which has collectively made this the greatest collection of photos diaper cake pictures and ideas on the internet. Carol, thanks for sharing your unique diaper cake with us! Such a great gift idea too! This is a Three tier cake with three hidden gift compartments a even a hand made Greeting Card. Instead of putting the gifts on the outside of the cake they are hidden inside the cake. You can open each layer and still put the cake back together without messing it up. The outside is decorated with scrapbooking items and ribbon. I used tissue paper to line my gift boxes but you could also use receiving blankets, baby towels or washclothes.